It’s time to publish the statistics derived from the cyber attack timelines of September (Part I and Part II), a month that shows a new uptick in term of number of events given that I collected 106 events against the 80 of August. And as always, let’s start with the Daily Trend of Attacks chart, where we recognize quite a high constant level of activity that curiously follows precisely the weekly cycle (in that there is few/no activity during the weekends). Malware is stable on top of the Attack Vectors chart soaring to 43.4% from 35% in August. Targeted attacks rank at number of two of the known attack vectors with 17% (it was 12.5% in August). 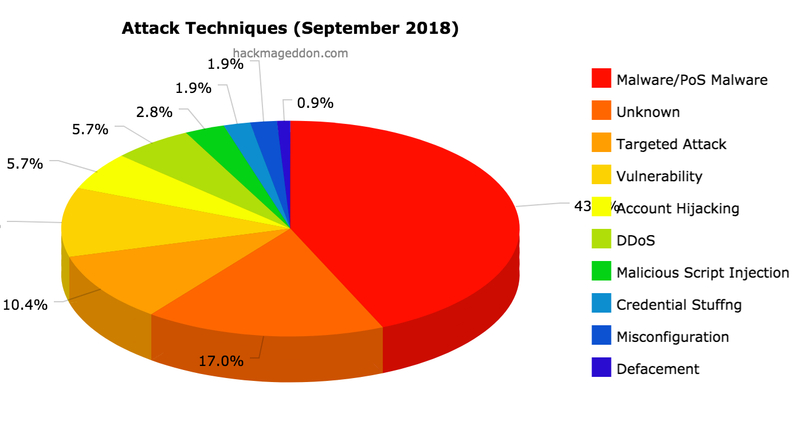 Vulnerabilities jump to 10.4% and were in August the third known vector. Even in August, single Individuals rank on top of the Distribution of Targets chart with 19.8% (slight down from 22.5% of August), sharing the first place with the multiple industries category (it was 13.8% in August). Public Administrations slide to number three with 10.4%, down from 13.8% of August.